Demand for exclusive holiday homes and rural lifestyle retreats is driving sales in Spain’s most desirable coastal areas. Sales of high-end homes in Spain’s desirable cities and coastal areas soared in 2018, as wealthy foreigners snapped up exclusive holiday homes and rural lifestyle investments. According to luxury real estate agency Lucas Fox’s latest Market Reports prime sales (above €900,000) increased by 28% year-on-year across the group, whilst the regions of Barcelona, Costa Brava & Girona, Valencia, Ibiza and Marbella saw prime sales increase by 56% across the regions as a whole. The average price for a Lucas Fox prime home in these regions during 2018 was €1.65 million. The proportion of foreigners buying prime property in these regions was 76%. Of the international buyers, British buyers accounted for 22%, French accounted for 20% and Americans 14%. Just over half of the international buyers (53%) purchased a secondary residence, with 22% buying a primary residence and 20% for investment. In recent years foreigners have been key to reviving Spain’s residential property market, playing a much bigger role than a decade ago. In 2010 there were around 19,800 sales by foreigners, which increased to around 65,500 in 2018, showing an increase of around 230%, according to Registradores, the Spanish Land Registry. In 2018 foreign buyers accounted for 12.6% of sales volume in Spain, government data shows. For decades the British have been the largest group of foreign buyers in Spain. They accounted for 15.5% of foreign buyers in 2018, up from 15% in 2017, suggesting that the prospect of Brexit is not currently deterring buyers. According to Spain’s Department of Development, prime sales in the first nine months of 2018 increased by 13% across Spain and by 27% in Girona Province when compared to the same period in 2017. 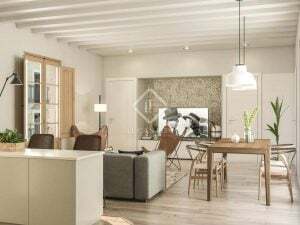 Lucas Fox recently opened an office in Girona City where demand for both city homes and inland rustic estates has been on the rise.